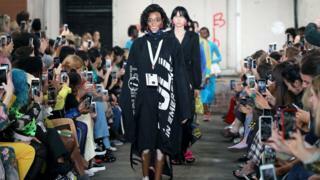 Was this the most diverse London Fashion Week to date? Victoria Beckham chose 47-year-old Stella Tennant to open her debut show in London, model Winnie Harlow, who has vitiligo, opened for House of Holland and wheelchair user and former Paralympian Samanta Bullock closed at the Fashion's Finest show. Last week, Kate Moss welcomed the increase in diversity in the fashion industry, saying it had changed for the better. "There's so much more diversity now, I think it's right. There's so many different sizes and colours and heights. Why would you just be a one-size model and represent all of these people?" Designer Steven Tai, who has worked at design houses including Viktor + Rolf, teamed up with photographer Rankin and charity Changing Faces to challenge the fashion industry's perception of beauty. At his show he had models with visible scars or disfigurements alongside conventional models. 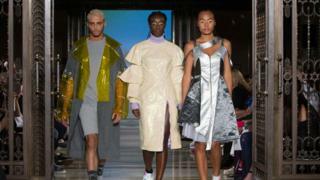 Speaking after his show on Sunday, he said: "It enriches the setting and enriches the clothes as well. It gives the context of the collection a lot more depth. "I just want an accurate reflection of the world that we live in. I think as much as fashion is about telling a story, it needs to be conscious of the social responsibilities as well and the effects that it could have on younger girls growing up. Brenda Finn was one of the models in the show and told the BBC the feedback after coming off stage was "amazing". "They loved that the show looked so much more real. People are interested in how the clothes fit on a different body, and on women who look like me." Finn, who has had alopecia since she was 14, said she was "treated like a leper" when she was younger, and had to be taken out of school because the bullying became so severe. "To be seen as different was seen as negative," she says. "Ten years ago I never even thought we'd see someone like Winnie Harlow in a magazine, so we've made great strides. "I hope that someone seeing this show thinks they are normal and can do what they want to do. It took me a long time - I wasted six years of my life before I got to where I wanted to be - so I hope it can help others." 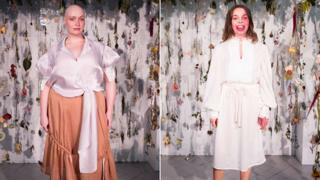 Chloe Root, who was born with a port wine stain birthmark, which covers about half of her body and two thirds of her face, also modelled in Sunday's show. "I've never seen women who look like me in the mainstream media - it's disheartening to feel like I'd never look like that and never fit in. "It's frustrating that it's such a mono-culture - not just for someone with an obvious difference, but also for someone who's walking down the street that isn't a size six. "It creates a unity, that goes beyond fashion." Supermodel Eunice Olumide has added her voice to the discussion: "The fact that we're not able to represent reality in the industry is a problem," she says. "We're looking at life through a very parochial lens. When I started out, people in China and other markets wouldn't even look at you if you're dark-skinned. "There are no requirements for diversity in the industry," continues the Scottish model. "How can you have an industry that's worth trillions that has no regulation? There's no minimum wage for models, no requirement to make clothes in different sizes. It's common to have hairdressers who have never worked with afro hair before. "That reflects badly on you as the model because you don't look good, and won't get re-booked." Fashion commentator and campaigner Caryn Franklin says she's "thrilled" more and more younger designers are taking the issue of representation seriously. "Teatum Jones have led the way by using models like Kelly Knox and I know they have been hugely influential. 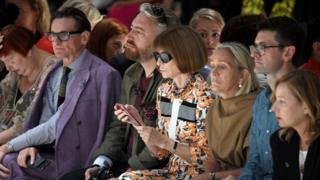 This conversation gets louder every season," says the fashion expert. "Repetition is key - when we see something over and over again we normalise it. That's why it's important to see a range of body shapes. "Fashion has to wake up to the needs of the end user and show a broader range of people. We all want that. In fact, studies show when the audience can make a connection to the model wearing the clothes, the desire to actually want to make a purchase is increased by 300% - so it's a business no-brainer," she says. But the obstacles to presenting a show at fashion week with various size models are not only due to "fear of putting their head above the parapet" on the part of the fashion houses, as Franklin puts it, but also one of logistics. Designers make clothes in sample sizes - meaning that it's, literally, a straight-forward one-size fits all approach to dressing models. For plus-size or "curve" models, there is more work involved planning the show and getting the model in for repeat fittings to make sure the clothes look good on them. But some don't see that as an excuse. "The UK is still really far behind," says Beth Willis, co-director at model agency Bridge. "New York had their best year yet in terms of the number of bigger models and those of colour who were walking in campaigns. London is still using a token plus-sized model here and there." Willis, who runs an agency for curve models, says none of her models were booked for London Fashion Week - which she says was "not a massive surprise". The plus-size fashion week in May, on the other hand, saw her models booked out: "That's great, but we shouldn't need a plus-size fashion week at all," she says. She says she's "frustrated" by what she sees as PR stunts on the part of brands. "Generally a lot of these clients will use a token model and get some good press, but that's it. The repeat bookings are what we need. Designers can't just do one-offs - we need to be changing the face of things regularly." Brands like River Island, Asos and Figleaf have been lauded for their inclusive advertising campaigns and clothing lines directed at different sections of the population - including plus-size and maternity. "Fashion week hasn't really been the place where strides are made on diversity," says Willis. "Some people within the industry think it cheapens the brand - and it's not seen as cool. "Where it needs to come from is the students - so when they're learning pattern-cutting and doing their first shows they need to be thinking about clothes which suit different body shapes. Scaling up a design for a size six doesn't really work. "It's got better over the past 30 years," Willis says, "but more needs to be done. In terms of the number of brands we work with, that's increased massively - but if you look at New York they are just killing it. You look at the likes of big name models like Ashley Graham, and that doesn't exist here yet. There's a massive difference in what they're doing compared to us." Hanging on to the last few days of summer. Shop my @swimsuitsforall #AshleyGrahamxSwimsuitsForAll Essentials collection - link in bio! Olumide says she's seen fellow models heading to New York agencies because they think they may be more likely to get work there: "In the UK we are much too safe, fashion houses will use people who they know and who they've used before. "In the US they're interested in who'll sell. There's a migration of models to New York because there they are more likely to take a risk." In February's fashion week, it was calculated 34.6% of shows represented models of colour in London - compared to New York's 37.3%. The British Fashion Council said in a statement: "Our numbers are above the national UK average representation of 15% but we'd like it to be closer to London's population average of 40%. "The BFC's objective is for London to become the most diverse Fashion Week." Tamara Cincik, who runs Fashion Roundtable, an organisation which promotes representation in the fashion industry, agrees with Willis and Olumide: "It's always New York that is leading the way. To be world-leading you have to make changes. And make changes within the organisation. It goes deeper than what's on the catwalk. "Just because Edward Enninful's at Vogue they think that's it," she adds. "But we're still at the point where you have PRs this London Fashion Week going up to women of colour and asking them why they're sat on the front row at a show. "One editor of an Italian fashion magazine was sat on the second row while the rest of her team were sat on the front row - because she is of a different ethnicity. It's disgusting. "Two other editors I know, who are women of colour, were asked whether they were seated in the right seats at two different shows. Both had front row tickets. It plays into a trope of the norm not being women of colour in positions of power and agency - which is what the front row signifies: think front bench in Westminster." The former stylist says the fashion industry runs the risk of alienating many would-be customers by its lack of representation. "I was discussing it with another fashion industry insider and she said she thought the diversity on the catwalk this week has been terrible. Burberry had some inclusion but other big brands had nothing. "There is a changing demographic. You cannot just have white privilege on the front row, within the organisation and then in the casting, and expect that to resonate with consumers. I think it's got a long way to go." And that doesn't even take into account the number of shows where disability is not considered - either on stage or off: "At plenty of shows you can't get a wheelchair in them," says Cincik. "Organisations need to start thinking we can't show here if there is no disability access, however cool it is." Fashion's Finest was, however, one of the LFW shows which represented disabled people by the inclusion of model Samanta Bullock - a wheelchair user. The Brazilian model, a Paralympian and former wheelchair tennis champion, has been working on and off as a model for the past 30 years, and says it feels like "change is coming". Previously, her work was mainly for fashion aimed at wheelchair users. Now she has done a number of high-end shows and campaigns aimed at the mainstream market and is optimistic about the future. "If you don't show people in a wheelchair or disabled people in magazines, it's like we don't exist," she says. "A few years ago it was the same for black people, or gay people. It's the right thing to do to show all different types of people. "It's like opening Pandora's box - people aren't going to go back to how it was before. Once you know what is right, you don't go back."